Here is another fun resource that I forgot to add to my earlier post about roller coaster design applications. 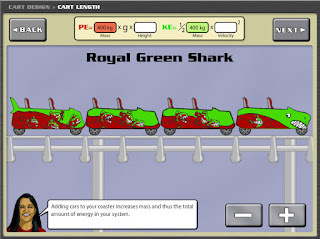 This one definitely focuses on math and physics when your students design the ultimate coaster. What a great application of science concepts in a fun way! I'm putting together science resources for StarrMatica, and this is a great example of using math and science in a problem solving situation. Thanks for sharing! What fun! Students will enjoy putting their math and physics skills to use by creating their own coaster.